A chordophone is a musical instrument that makes sound by way of a vibrating string or strings stretched between two points. It is one of the four main divisions of instruments in the original Hornbostel-Sachs scheme of musical instrument classification. What many would call string instruments are classified as chordophones. 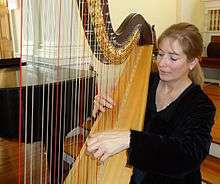 Violins, guitars, lyres, and harps are examples. However, the word also embraces instruments that many westerners would hesitate to call string instruments, such as the musical bow and the piano (which, although sometimes called a string instrument, is also called a keyboard instrument and a percussion instrument). Hornbostel-Sachs divides chordophones into two main groups: instruments without a resonator as an integral part of the instrument (which have the classification number 31, also known as simple); and instruments with such a resonator (which have the classification number 32, also known as composite). Most western instruments fall into the second group, but the piano and harpsichord fall into the first. Hornbostel and Sachs' criterion for determining which sub-group an instrument falls into is that if the resonator can be removed without destroying the instrument, then it is classified as 31. The idea that the piano's casing, which acts as a resonator, could be removed without destroying the instrument, may seem odd, but if the action and strings of the piano were taken out of its box, it could still be played. This is not true of the violin, because the string passes over a bridge located on the resonator box, so removing the resonator would mean the strings had no tension. Electric string instruments often have an electromagnetic pickup that produces a signal that can be amplified. The electric guitar is the most common example, but many other chordophones use pickups—including mandolins, violins, and the overtone koto. When a chordophone is played, the strings vibrate and interact with each other. There is usually something that makes the sound resonate, such as the body of a guitar or violin. The strings are set into motion by either plucking (like a harp), strumming (like a guitar), by rubbing with a bow (like a violin, cello or double bass), or by striking (like a piano or berimbau). Common chordophones are the banjo, cello, double bass, dulcimer, guitar, harp, lute, piano, sitar, ukulele, viola and violin. A 3,300-year-old stone carving of a Hittite bard playing a stringed instrument is the oldest iconographic representation of a chordophone and clay plaques from Babylonia show people playing an instrument that has a strong resemblance to the guitar, indicating a possible Babylonian origin for the guitar.